A team of researchers unintentionally have created nanorods when an experiment they were involved in did not go as planned. They then decided to have a closer look at the microscopic, unplanned nanorods. Researcher Satish Nune, a chemist, was testing the solid nanorods that are rich in carbon with a vapor analysis tool and he observed that the nanorods strangely lost weight when the humidity went up. Nune and team used another high-powered microscope to test them as they presumed that the first tool had malfunctioned. This revealed an unexpected phenomenon - an unknown fluid was oozing from among groups of tiny sticks. The video recorded under the microscope was initially unstable, as they swiftly moved the view finder to trap the unanticipated event again. The team belonging to the Department of Energy's Pacific Northwest National Laboratory (PNNL) went on to view the same phenomenon over a dozen times. Directly after forcing out the fluid, the weight of the nanorods reduced by nearly half, which puzzled the team further. An article published today in Nature Nanotechnology illustrates the physical methods behind this phenomenon, which just happened to be the first trial viewing of a phenomenon theorized over 20 years ago. The breakthrough could pave the way for a wide range of practical applications, such as fabric that automatically absorbs sweat away from the body and expels it as vapor, and low-energy water harvesting and purification for the developing world. Our unusual material behaves a bit like a sponge; it wrings itself out halfway before it's fully saturated with water. "Now that we've gotten over the initial shock of this unforeseen behavior, we're imagining the many ways it could be harnessed to improve the quality of our lives," said PNNL engineer David Heldebrant, one of the paper's two corresponding authors. Normally, materials tend to absorb more water as the humidity surrounding them increases. But, these carbon-rich nanorods — which the researchers by chance developed while trying to fabricate magnetic nanowires — unexpectedly expelled a huge quantity of water as the comparative humidity inside the specimen holder went up 50 to 80%. Water expulsion can plainly be viewed in the microscope video. Water is visible as a gray, cloudy haze — and only materializes in the area where the nanorods intersect. The team noticed that when humidity was further increased, the weight of the nanorods also increased, thus specifying that they were absorbing water again. It was also reversible, with water being expelled and later absorbed as humidity was steadily decreased. The team became even more curious. They were not able to think of any other material that was capable of absorbing water at a low humidity and instinctively expels it at a high humidity. Therefore, the team scanned numerous scientific literature to find a reason. They then came across a 2012 paper in the Journal of Physical Chemistry B that explained how the liquid could unexpectedly evaporate in specific situations where liquid is confined in a miniscule space (approximately 1.5nm wide). Similarly, the authors of a paper written in 2013 in the Journal of Chemical Physics illustrated how water could condense into the boundaries of close hydrophobic materials, which do not react properly with water, and rapidly convert into vapor due to strong forces between the surfaces of the two materials facing each other. The 2013 paper provided this phenomenon with a lengthy technical name: "solvent cavitation under solvo-phobic confinement." These papers also revealed the method was theorized in the start of 1990s by researchers studying crystallized proteins. At that period, researchers observed they only saw water vapor enclosing hydrophobic sections of protein, while liquid water would enclose other areas. The researchers planned that there was some type of method that enabled the water caught between hydrophobic protein sections to unexpectedly vaporize. 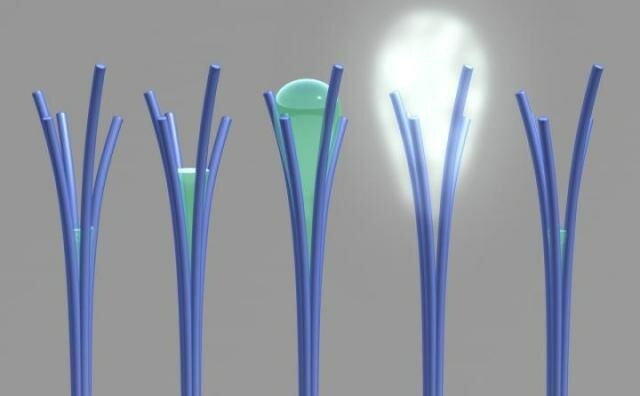 The PNNL team took in all these information and hypothesized that water was condensing and developing into a bridge between the nanorods, via a method referred to as capillary condensation. Subsequently, they began to see that the water between rods developed a curved cavity whose surface tension draws the adjoining rods closer together. When two intersecting nanorods expand to approximately 1.5nm, the team rationalized, the water caught between them could be expelled to rapidly evaporate. It sure is a significant achievement understanding the unanticipated behavior of nanorods. The PNNL team goes on to predict a future where this occurrence could also better the quality of life. They see their finding as a probable humanitarian lifesaver, and have recounted the same as “a paradigm shift in water purification and separation” in their paper. In theory, huge amounts of the water-spitting nanomaterial could repetitively absorb and then eject absorbed water when a definite humidity level is realized. This kind of system could be applied in remote deserts, where water can be gathered from the air by it and harvested for human use. Another goal is to develop a membrane that absorbs and later releases water as humidity changes. The membrane could be applied in jacket fabrics and offer better comfort during outdoor adventures by expelling sweat from the inner side of the jacket and emitting it outside as vapor. In order for these applications to become a reality, the researchers are testing ways to exploit the ability of the nanorods to spray water. The team predicts just about 10 to 20% of the material releases water right at the moment. The plan is to expand the manufacture of the current material, developing just over a few grams of the material at a time. They will perform additional analysis to guarantee that the occurrence continues to exist when extra nanorods are present. They are also performing a highly thorough assessment of the physical and chemical properties of the material, and establishing if other materials possess similar such properties. The team is curious about the idea that various nanomaterials could probably be designed to cature other liquids, such as methanol. This research is funded by PNNL's internal Materials Synthesis and Simulation Across Scales Initiative. The project also used the knowledge of staff and many advanced instruments such as environmental transmission and scanning electron microscopes, a Mössbauer spectrometer, and an X-ray photoelectron spectrometer — at EMSL, the Environmental Molecular Sciences Laboratory, a DOE Office of Science User Facility at PNNL.